Suddenly Sneakers runs to the edge of the deck and barks at the oak tree. "Sneakers, what's gotten into you? Are you defending me against a tree?" I glance up--and catch a flash of blue between the green leaves. Of course, everyone else is inside, so nobody sees the parrot but Sneakers and me. And Socrates the cat. He stares up at the tree, too, his tail twitching. The parrot flutters to a higher branch, then perches and looks down at me. Suddenly he lets out a loud "Braaaak! Phone home! Time to fly!" At first Zoe has a hard time convincing Dr. Mac and the other Vet Volunteers that there is a flock of wild parrots --and one blue-capped talking parrot as well--in the Pennsylvania backyard of her grandmother's veterinary clinic. But soon the whole group is busy googling feral parrots and trying to come up with a way to return the obviously lost talking bird to its owner. At last a chance to capture the lost pet presents itself, and Zoe is distressed when her attempt to catch the parrot she names E.T. results in a broken wing. But her grandmother Dr. Mac treats the bird and assures Zoe that the little parrot will be mended with a few weeks of care in her clinic. But then Zoe gets a surprising phone call from her mom--the actress who left her with Dr. Mac almost a year ago when she set off to Hollywood to try to find work in the movies. At first Zoe had grieved over the loss of her mother and her familiar home in New York City, but now--with the love of Dr. Mac, her cousin Maggie as her best friend, and the fun of being with the other vet volunteers at school--Zoe has to admit to herself that she resents her mom's sudden intrusion into her happy life in Ambler and her plans to take her to L.A. to start a new life together. That night in bed I can't seem to fall asleep. Watching the curtains move in the warm spring breeze, I can smell spring. I smell the rich green smell of the earth coming back to life. New York never smelled like this at night. I wonder, what do L. A. nights smell like--car exhaust? How can people there enjoy spring when they never have winter? A scene from one of my favorite movies pops into my head, The Wizard of Oz. Mom and I must have watched it a thousand times. It's that scene when Dorothy closes her eyes, clicks her ruby slippers together, and murmurs over and over, "There's no place like home," as she waits for the magic to take her home where she belongs. But where do I belong? Where's my home? I don't even know anymore. 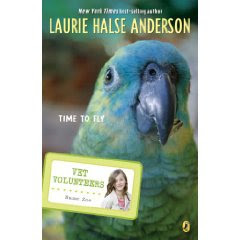 Zoe and her mom have some serious work to do to come up with a plan to ease Zoe's transition to life in L.A.--before, like little E.T., it's her time to fly, but then, making transitions is the over-arching theme of Laurie Halse Anderson's Vet Volunteers series. As in the other books in this series, animals in need figure strongly in the plot of this new edition of Time to Fly #10 (Vet Volunteers), but dealing with the changes that come with life and growing up is the real subject of the novel, handled realistically here by a skillful and sensitive author. I had the opportunity to read this book a few time ago and I have to say it's totally awesome. I enjoyed so much and also I learned enough.